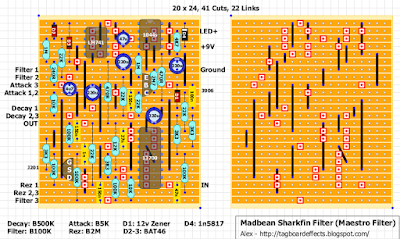 Here is a layout for Madbean Sharkfin filter side. Moved bottom left 3K3 resistor up one row to connect it to 150n output cap. Nice Job! Thanks Alex. Still thinking this could work well in a wah pedal. Mmmmmm! How about a layout for only the sample&hold part? (if that is even possible) That's the part I'm most interested in. Agree! That'd be a great toy. Could any pro do that? Cheers! The Sample&Hold part wouldn't work on its own. 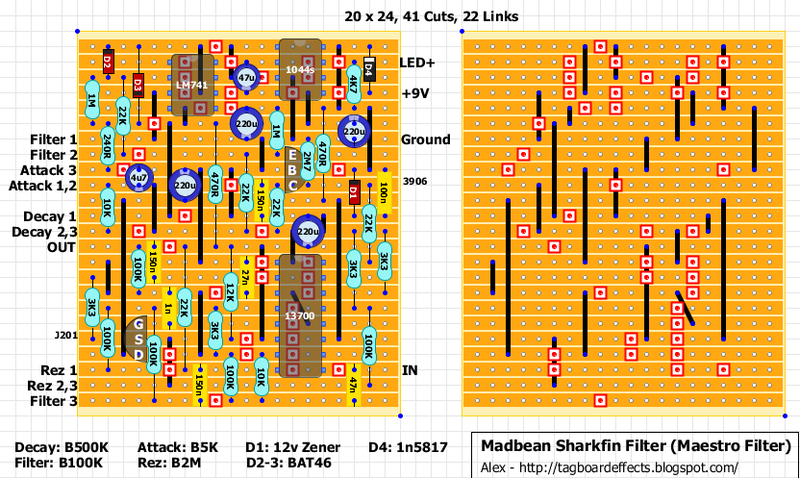 I've added a layout in the Forum-Contributions. OK, so sample/hold board that could be plugged to my snow white filter or any envelope filter make sense. This thing sounds fantastic. However, it needs a boost at the output, since there is a volume drop when engaged. I threw in an LPB-1 with a trimpot. Did the trick perfectly. I've built a few envelope filters and this is my favorite one by far. Curious, do you think the 2n3906 is necessary when just building the filter side? It looks like it's wired as a switch that would be triggered on/off based on the sample/hold side. I'm wondering if that's how the pulsing is achieved with the full sample/hold design. Maybe the 2n3906 and the 1M at the emitter can be omitted for this filter-only layout? Would also have to move the 22k connection at the emitter down 2 rows to connect with 150n and other 22k resistors. Not a big deal, just trying to understand the 2n3906's function. I guess it would be easy enough to test.